I had never heard of Buckeyes until my brother moved to Ohio and married an Ohio gal. I remember the first time I saw a plate of “buckeyes” at a holiday party. They were odd looking. They looked like a Reese’s peanut butter cup, but NOT. And, they had toothpick marks in the center. But, ohmygosh, they tasted so amazing. Needless to say, I got the recipe from them immediately, and have been making them for the past 8 years! It occurred to me I haven’t shared the recipe here on the blog yet! Especially now that I live in Ohio, it’s only fitting that I share this beloved treat. Do people around the country make these? Was I the only one living under a rock? Most Ohioans will leave the toothpick marks in the buckeye. I don’t know if that’s a trademark or laziness. But it offends me, haha! So after my buckeyes have been dipped in chocolate and all set, I pinch the toothpick mark closed. Is that wrong? Am I offending any traditional Ohio buckeye rule? Anyway, these buckeyes are soft and tender in the middle peanut butter layer, and the crunch of the chocolate coating? Oh my! I use Ghirardelli Chocolate melting wafers to dip mine in. The original recipe called for “Chocolate and wax, mixed and melted.” Ummm, I’m assuming it’s paraffin wax, but the lack of measurements scared me. So, I went with what I know will work. And will set up beautifully. ENJOY. 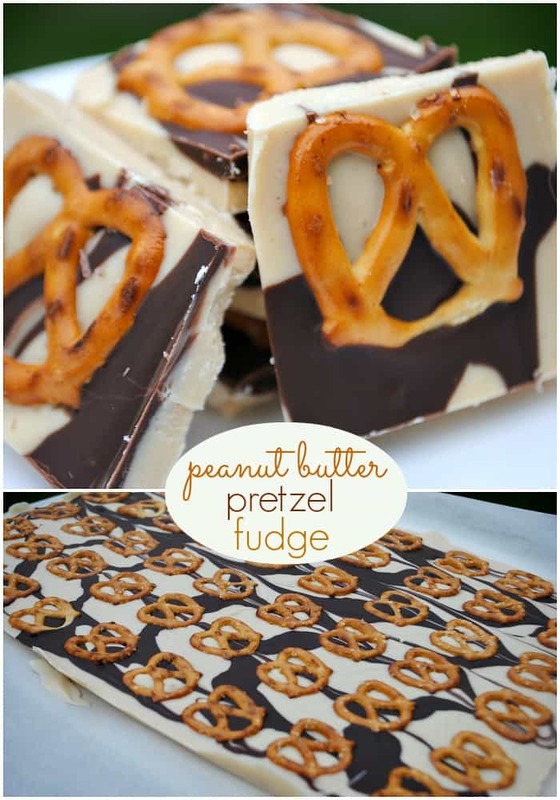 Love chocolate & peanut butter? In a large mixing bowl, blend melted butter, powdered sugar, peanut butter and vanilla extract until fully combined. Scoop balls and roll them into your hands, making about a 1-1/2 inch sized ball. Place on a parchment paper lined baking sheet and repeat until all filling is used. Melt chocolate according to package directions. Using a toothpick, dip bottoms into melted chocolate (leaving some of the peanut butter tops exposed). Place on parchment paper and allow to set. If desired, when chocolate has set, pinch the toothpick marks closed and pat until smooth. Store in an airtight container for up to two weeks. ENJOY. 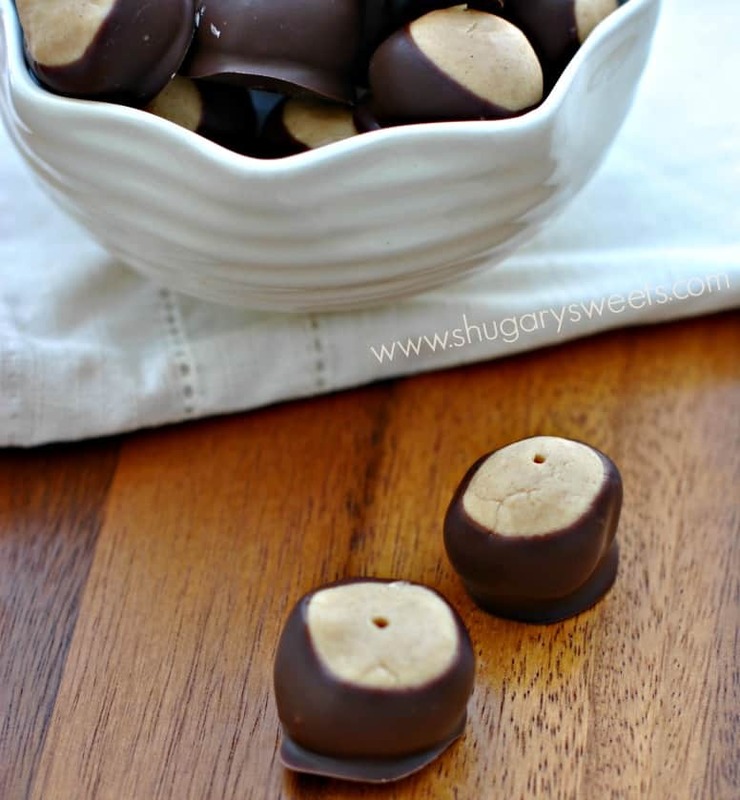 Today’s recipe for Peanut Butter Buckeyes was originally published on Shugary Sweets on December 11, 2013 and has been republished in July 2018. 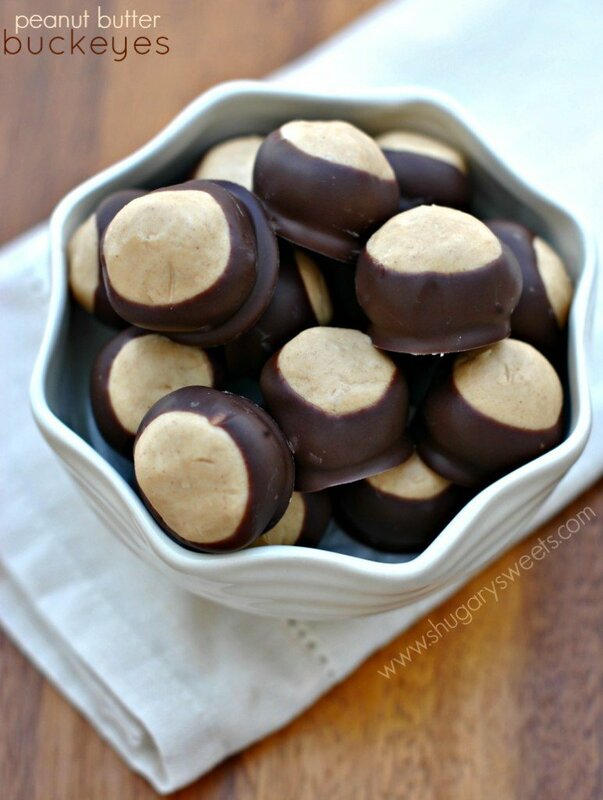 I absolutely adore buckeyes…I know that’s the “official” name but I always call them pb balls. And the holes offend me too…I always have to cover the truffles completely…and add sprinkles or chocolate drizzle. Now I’m seriously craving peanut butter!!! Whew, so glad to hear about the toothpick holes. I wasn’t sure if they were SUPPOSED to be there, LOL. I’ve never heard of Buckeyes (I’m from NC), but they look delicious. I think I’ll have to give them a try. These are always one of the first things we make on our families holiday baking day! Love anything peanut butter and chocolate! We’re Kentuckians and to my knowledge have never had family from Ohio so we must have had a nice Ohio friend a few generations back who showed us their buckeye recipe – my thanks to them, for it’s my favorite!! One of the best things to come out of Ohio!! Love Buckeye’s, with toothpick holes or without! With as much as I love peanut butter and chocolate, I am surprised I have never had buckeyes before. Will have to change that. This recipe is calling my name!!! Welcome to life outside of the rock, LOL!! I must have been under the same rock. 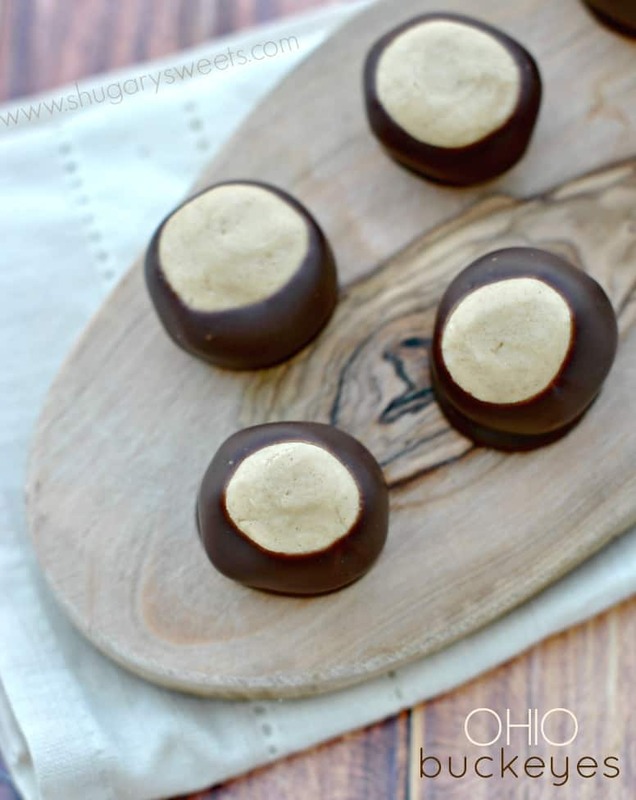 LOL Never had buckeyes, but this recipe looks so simple I think even I can do it. 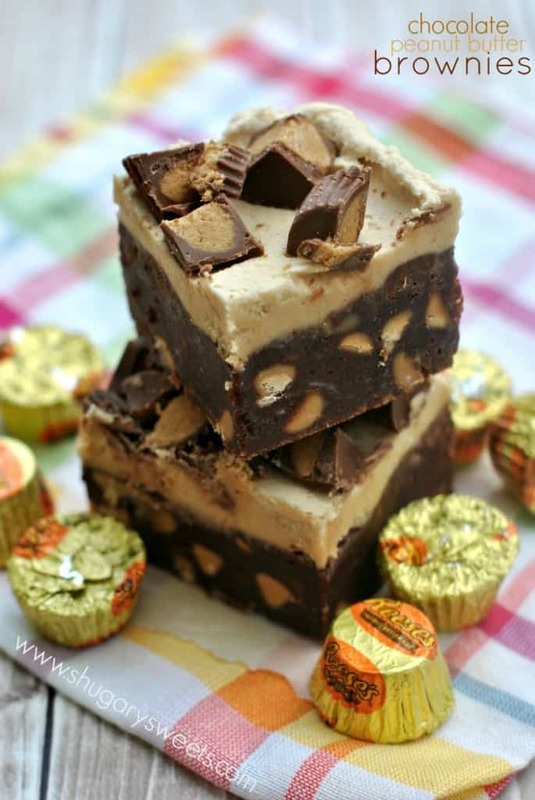 Although I’m not a huge sweet lover, I do like Reeses peanut butter cups and how can you not bake sweets at Christmas. So, I’m adding these to my list of other goodies to make this holiday. 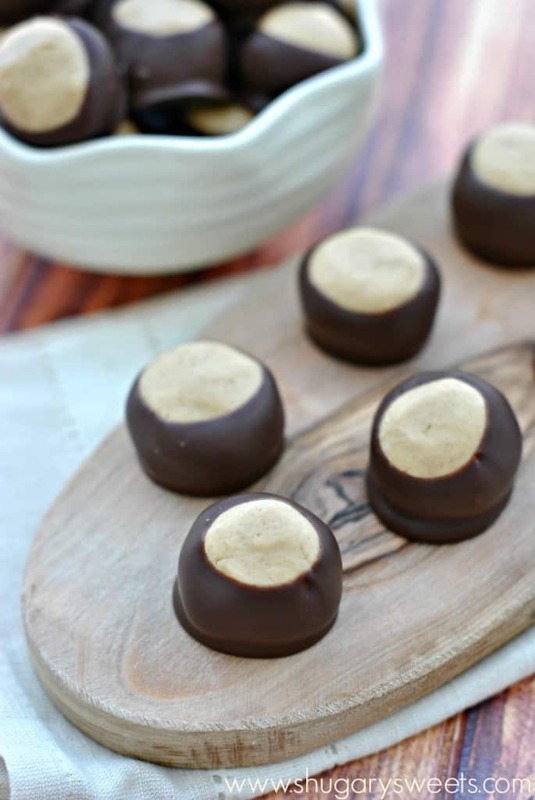 Buckeyes – the best dessert known to man. 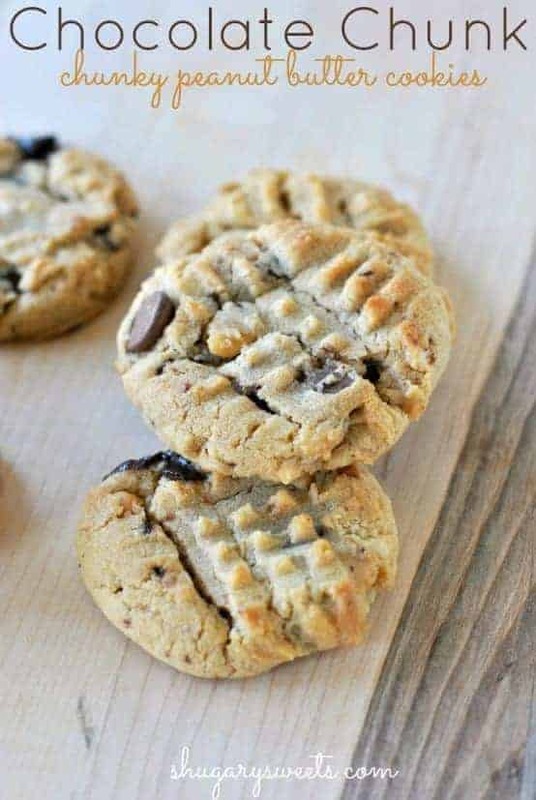 I love how easy they are and that they taste like a reeses filling! Haha – Love these even without the “hole”, lol. 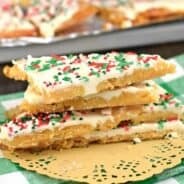 These are a classic, I love how simple they are – they are definitely one of those recipes that I will be making forever! One of my best friends in college was from OH, and she made an enormous batch of buckeyes every year. I think of her every time I see them, and I’ve craved them every Christmas since! 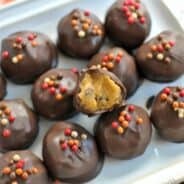 I have made peanut butter balls for years, My husband brought the recipe hoe from someone he worked with. I was glad it would be something I would not eat because I have never liked Reeses cups. Welllll, much to my surprise I loved them. So much better than the Reeses cups. We cover the whole peanut butter ball with chocolate. My recipe has more peanut butter and sugar. Makes about 80-100 depending on the size. Also have to put in freezer to keep chilled before dipping. They are soooo good!! Love that you dip them completely in chocolate! I want to eat these! I’m in Michigan, so not far at all, but this year (in blogland) is the first that I’m hearing of these buckeyes. I think I might use those new Ghirardelli melting chips I saw at the grocery store the other day. Mmmm. I love thos Ghirardelli melts too, they would be perfect for these buckeyes!! And the holes seriously offend me too…they just look undone so I always patch it up. My recipe originally called for paraffin wax, too, but I leave it out because it’s not something I keep on hand. Glad to know someone FROM Ohio is offended by the holes too, haha!!!! I have never had these or seen these at a party, but i do love resses so I think these might be right up my alley! I am familiar with the buckeyes 🙂 these look perfect and I am dying to have some now! I just made these tonight and they are awesome! Do you store them in the fridge? I loooove me some buckeyes! I always patch up the toothpick holes too, but they don’t offend me. It also surprised me that other people don’t know about them. As a native Ohioan, I’d never realized it was a local thing. I guess I assumed that we (as Buckeyes) were way more ‘into’ this particular dessert, but I never realized that they weren’t a common find elsewhere. Interesting! I grew up in Michigan, right near the Ohio border. Buckeyes have been a holiday tradition for as long as I can remember. So imagine my surprise when other states I’ve lived in, they were unknown…but not for long! lol. The recipe that I’ve always used calls for graham cracker crumbs in the peanut butter as well. Coming from someone that lived their first 25 years in Ohio, I think the toothpick mark is laziness 🙂 My grandma left it, but my mom tries to cover hers up, and so do I. Dipping the chocolate so the edge comes right to the toothpick is an easy way to cover it up, the hole just fills with chocolate! Or I make buckeye ‘pops’, that way you just leave the stick on! Haha, glad you cover the toothpick holes too!! 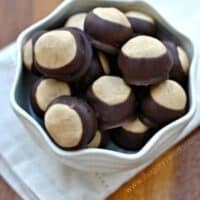 My mother also used wax in her buckeye recipe, she also made them every year. A hit at family Christmas parties. Buckeyes are supposed to look like exactly that, buckeyes- so they shouldn’t be covered entirely in chocolate. While the holes aren’t “supposed” to be there, I think its rude to assume its due to laziness! The thing is, by the time you roll them all, the peanut butter is soft and its hard to cover the holes at that time. Then, after freezing, the ball is often too hard to cover the holes. Everyone that makes them should know this! Obviously they’re prettier with the toothpick holes removed and maybe some people are lazy but I don’t assume everyone that makes these wonderful balls is lazy! Also, aren’t you just grateful your SIL even shared the recipe?!!! You laugh at the “laziness” of the people who make the recipe however you really thought the recipe called for paraffin wax?! It calls for melted chocolate. Hard shell candy coating is blasphemy. Oh- and learn to spell ‘anyway’ – there is NO ‘s’ on the end of ANYWAY!!!!! I grew up eating buckeyes in Ohio, and I was really disappointed with this rendition. I had never tried Candiquik coating before, so it didn’t strike me as a bad idea when I first saw the recipe. But now I know. Candiquik is a poor substitute for real chocolate. Dip the PB balls in melted semisweet chocolate, and you’ll taste the difference. No offense, but these tasted like peanut butter flavored sugar dipped in chocolate flavored sugar. Instead of like a Reese’s Peanut Butter cup in ball form, as it should taste. Yum! My friend in Ohio always sends me a box of these for my birthday, they don’t last long. Now I’m excited to make them year round. Go Bucks! You all that say it is laziness by leaving the toothpick hole there are all idiots!! And have NEVER lived with CHRONIC PAIN and still made these every year. You that say that are PATHETIC!!! Loved this recipe! So did my family! Although I did add one less cup of powdered sugar. Otherwise it was WAY too sweet. Even so, I love it! It was really easy to make. Happy Thursday and keep on desserting! Will these work without any ‘wax’ and just using melted semi sweet chocolate chips?! I sure hope so.. because this recipe is going to a cookie swap tomorrow and I had no idea about the wax hahaa! How long would these last before you’d have to eat them? Trying to be prepared and make a load for friends. Of course I’ll have to hid them from myself! I’ve made them a week in advance! Has anyone tried to make these by dipping in just semi-sweet chocolate without the wax? Does that work? Where is the recipe for the Buckeyes? In Ohio, many people leave the hole, not knowing how to cover it up without touching the buckeyes with their fingers and making a mess of it. 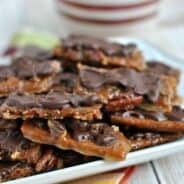 I make them with a candy dipper prong thingie and avoid the holes. For those dipping the entire thing in chocolate, that is delicious, but will no longer look be a buckeye. The buckeye is Ohio’s state tree – the candies aren’t submerged in chocolate so they look like the buckeye nuts. Any variation is delicious, but unless it looks like a buckeye nut, it isn’t a buckeye. Many melting wafers contain some form of wax. The purpose is to make a shiny finish as many people don’t know how to temper pure chocolate. Check if your melting wafers have wax in ’em or not. If you’re using pure chocolate – not Nestle chips – you will want to temper the chocolate for the snap and shine. This is a favorite treat at our house! We have started adding our own twist to it – I make the PB balls and put them between 2 mini pretzels and then dip half in the chocolate. So good! We especially make these for Sunday football in the fall but now that there in my head we might just have a batch this weekend 🙂 thanks! Hah, how adorable they look! Can’t wait to taste them, looks delicious!